If you’re not familiar with Groupon yet you’ve likely been living under a rock. Or maybe you simply aren’t into football or the internet. Between their Superbowl commercial fiasco and their sprint to an estimated $25 billion valuation, Groupon has been making waves, headlines and loads of cash. So for those of you who aren’t acquainted with the service, we’re going to break it down, sum it up and pass on whatever valuable tips we can so you can make the best decision for your business. When you boil it down to basics Groupon is a coupon site. Groupon will work with your business to offer a deal with the hopes of increasing your customer base, which given the popularity of the service seems a perfectly reasonable strategy. Groupon deals are always offered over a limited time, which you can choose and typically require a certain number of purchases before a deal is officially “on,” hence the “group” in Groupon. These aren’t your typical coupon deals of save 10% but rather blockbuster deals of 50% off or better. This aspect of Groupon’s deals is perhaps the most important because a savings so great can easily cut your profit margin to none. That’s not even factoring in that Groupon is going to be taking half of what you do sell through their site. So if you have a $100 service or product and you offer it at a 50% discount and Groupon takes half of that sale, you’re left with $25 and potentially hundreds or even thousands of customers ready and waiting to make that purchase. It’s serious business so it’s important you treat it as such. Let’s examine how you can make Groupon deals work for you and not involve bankruptcy. Now I should tell you, I’ve never run a campaign on Groupon but after doing some heavy research for this post I’ve come up with a few solid tips that I’d certainly apply to my own campaign if I ever run one. Tip 1: Focus on gaining customers, not making money. That sounds a bit contradictory right? But remember, whatever service or product you’re offering is being sold at a steep discount which makes profit very challenging. However, if you can offer a deal and break nearly even but gain X amount of new customers, long term profitability will see a nice rise. 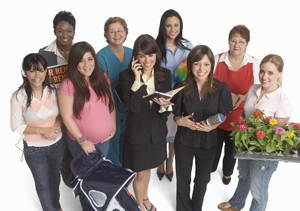 Tip 2: Prepare yourself, your employees and have a system in place. This tip goes hand in hand with the previous tip. Why’s it important? Let’s face it, most of the customers that come in to redeem their coupon will be first time customers, which means you’re making a first impressions and first impressions are pretty huge when it comes to business. Employees should know this and be extra courteous, so should you (duh.) Have a system in place, a system that allows you to take advantage of the increase in traffic you’re likely to see. For example offering a special bonus giveaway to every customer that redeems a Groupon coupon, have them fill out a short form with their name and email and boom you’ve just jump started your email list. Tip 3: Don’t discount your core service or product. Focus on simply getting people in to introduce them to your brand. If your core product is your hook, the Groupon deal should be your bait. Give it proper thought and get creative, start small to learn the ins and outs of how these deals work. Along those same lines, it’s definitely worth your while to do a bit of research. There have been several case studies, here’s one that focuses on a single Groupon campaign, it has some very interesting numbers and statistics to look at. There’s also been some research into how businesses overall think of their Groupon experience, in one study done by Rice University student Jesse Jones he surveys 150 businesses and presents his findings. An interesting statistic from this study, the Groupon promotion was profitable for 66% of those businesses. 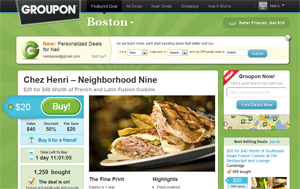 One thing I love about Groupon which has been a big part of their success, is how easy the service is to use. You’ll see what I mean as soon as you visit their site, they’ve built it a certain way that makes signing up and finding relevant deals something even your grandmother could do in minutes. Running a campaign deal with them is no exception, navigate over to their Get Featured page and start the process by filling out the form located there. After starting the process you’ll be contacted by an official Groupon representative who will walk you through the process of setting up your deal. Before you get in touch though, do you own research and think about what will type of deal will work best for your business. Got questions? Ask away in the comments below. Genevieve Coates admits her obsession with technology and how it relates to business. She uses her gift for writing to help the average person use and understand technology. She also provides up-to-date technical product news, unbiased technology and mobile/wireless reviews, and tips for using technology and social media tools online. When this self-confessed tech-junkie isn't online, she's tending to her second passion - her massive garden at home. Previous post: Is Liability Protection in Business Necessary?